Boys unishort dancewear (biketards) and dance shorts. Dance tights for boys and young men with and without feet - tall tights. Boys dance shorts made in London from quality Lycra fabrics in a selection of colours and styles. 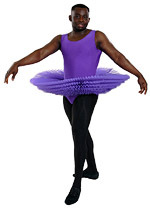 Ballet tutus for boys - tutus for dance competitions - bespoke tutus by request.